Your wife may have a job outside the home or she may be working all day at home taking care of the kids. Either way, there's a good chance she's busy and exhausted, just like you are. You know that amazing feeling you get when hearing the Imam's recitation at taraweeh prayer, while making du'aa in solitude, or while reading Quran? Your wife needs to feel that too. Don't expect elaborate meals. Yes, she will be rewarded for cooking for your family, but sometimes cooking in the kitchen just isn't the same as reading Quran or praying. Order food from a restaurant sometimes. Or go out to eat, whatever she prefers. If she's not fasting, don't make her wake up to make or warm up food for you. On some nights, stay home with the kids so she can pray taraweeh at the masjid. This may come as shocking news, but praying in a babysitting/mommy room is not the same as praying without kids around you. Help out where you can at home. This might be in the kitchen or with the kids (Think: baths, meals, bedtime, taking them outside to play). Raising children is exhausting. Wherever you can help, help! Allocate some time on the weekend when your wife can be alone. 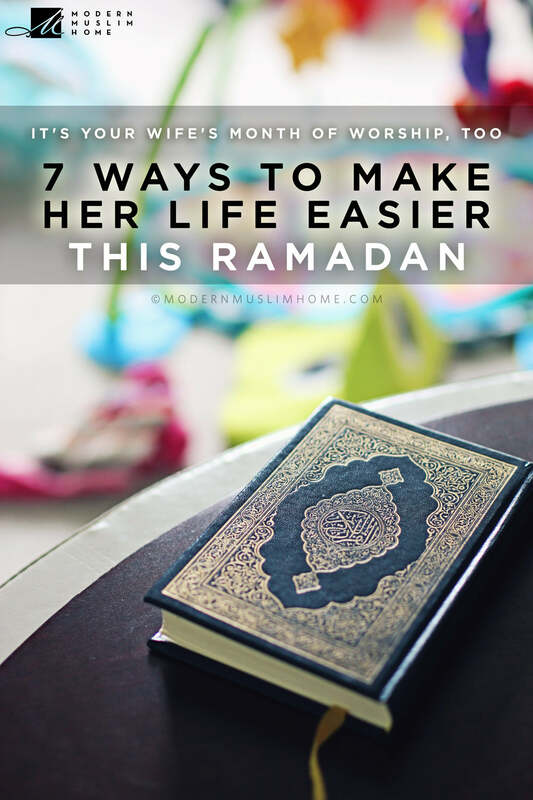 This can be a private area in the home where there are no disturbances, or better yet, encourage her to go to the masjid, or somewhere in nature (like a quiet park), or whichever place brings her closest to Allah. She will thrive if she has time to reflect on herself without having to fulfill the needs of others. Be a good example and give her an extra push to read extra Quran, or pray more. She is likely tired and could use the encouragement. Doing deen-related, family activities together (halaqa, reading Quran, salah, etc.) will allow you to spend time together while encouraging each other towards good. You are in this journey of life together with her. So, share the burden with her and help out wherever you can so that she can feel the joy of this month, too. Want to know the most important way to win your wife's love and God's pleasure? Do all of the above without making your wife feel guilty or like you're doing her a favor at all.